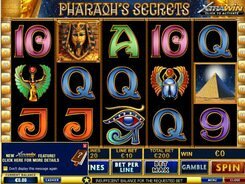 Unravel the Pharaoh’s mystery and find his riches in the five-reel 20-line Pharaoh’s Secrets slot machine. 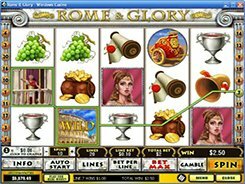 The betting denomination you can choose before spinning the reels varies from $0.01 to $2, with 5 coins max per line. Here you come across pyramids, scarabs, the Eye of Horus and other symbols that contribute to an ancient Egyptian theme. The wild is represented by the Pharaoh himself that pays out a jackpot of 5000 coins if five wild symbols line up on the reels. Besides, the Pharaoh acts as a substitute for other icons helping create winning combos. The Pyramid is a scatter symbol that has some advantages over other regular symbols. 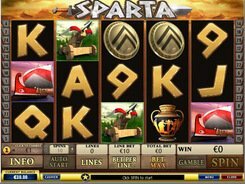 Three pyramids scattered anywhere bring you a win of x4 your bet, four icons pay x20, and five scatters pay x100. 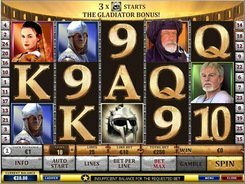 In addition, at least three scatters trigger the bonus round where you have to pick numbers getting free spins and multipliers as an award. PLAY FOR REAL MONEY!